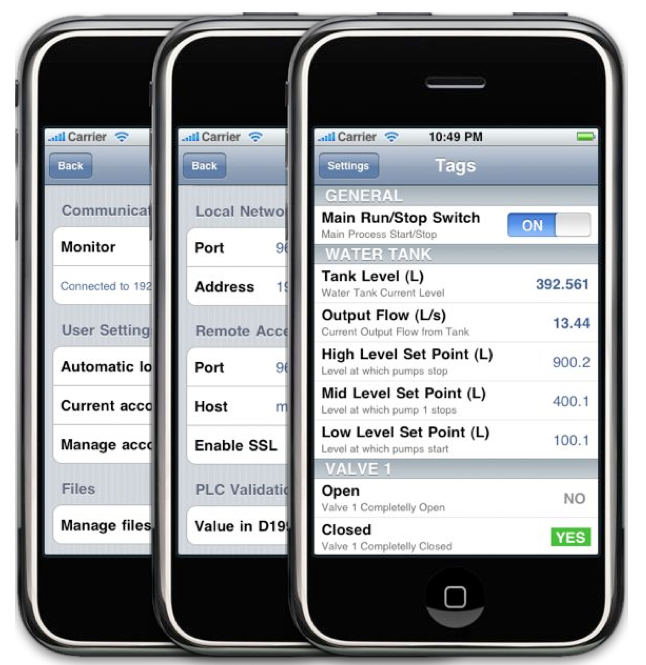 The App description states that the product can Monitor (display and change) PLC variables (tags) through local or remote wireless access. The Manual wich can be downloaded here describes how the App will access the PLCs over the internet. “ScadaMobile is designed to communicate with PLCs without using dedicated servers or any specific software installed on a PC. As for the Security, The product seems to support VPN (L2TP/IPSEC) as well as TLS/SSL in addition to a PLC-stored password mechanism. A password will be stored in the PLC data memory address D19998 as a 16 bit hexadecimal value (0 to FFFF) and you must match the password in your iPhone. – I couldn’t find anything about how the password is stored on the IPhone- But My guess that its not Encrypted. I guess I will try to find this by myself and will keep you posted. It seems that there are many more remote access apps on the way and I would love to see independent code-security reviews on each and every one. Finally, There are two versions from the app, ScadaMobile Lite for 3.0 $ with limitations on the number of processes. and the full version for 74.0 $. 2005, 2007 and now you can add November 2009. A recent comment by bernardo from Brazil (Here) on my previous post implies that this is a coordinated attack that took place at exactly 22 hours. when die hard 4.0 was about to begin on FX Cine Latin America !!. The Official response so far was ” the exact cause was not yet known but atmospheric problems, an intense storm, may have contributed to or caused the transmission lines to Itaipu to shut down.” said the the country’s minister of mines and energy, Edison Lobao to reuters. While the real cause of the problem remains to be unclear, it appears that hackers are not fond of the itaipu dam IT infrastructure. One thing for certain is that the itaipu servers has been “visited” before. Few days Ago CBS’s “60 Minutes” featured a report about alleged cyber incidents that took place in Brazil back in 2005 and 2007. claiming that the major power outages that affected millions was caused by hackers. Today Wired.com reported that Brazilian government officials disputed the CBS report over the weekend, and Raphael Mandarino Jr., director of the Homeland Security Information and Communication Directorate, told the newspaper Folha de S. Paulo that he’s investigated the claims and found no evidence of hacker attacks, adding that Brazil’s electric control systems are not directly connected to the internet. Shares in French state nuclear reactor builder Areva ( ARVCF.PK – news – people ) fell by 4% after France, Britain and Finland ordered it to modify their next-generation power plants on which it has staked future export growth. the new generation of French nuclear power reactors came under attack last week as opposition parties called for an inquiry into their security systems, after three nuclear safety bodies asked for changes to their design. The three nuclear safety bodies cited concerns about the ‘adequacy of the safety systems’ and their independence from control systems. Keeping these areas independent helps prevent both failing together. the joint statement said. The problems, which were first detected in June by the British Nuclear Installations Inspectorate (NII),concern the control and instrumentation (C&I) of the Areva-built EPR (European Pressurized Reactor). The C&I runs the computers and various systems that maintain the reactor’s performance, such as temperature and power output. The concerns raised are related to the system that regulates its daily operations and the system that shuts it down in case of an incident, which are viewed as not being sufficiently independent of each other. In its current state the software cannot guarantee the necessary safety requirements, the report noted. FDA wants to remind you that cybersecurity for medical devices and their associated communication networks is a shared responsibility between medical device manufacturers and medical device user facilities. The proper maintenance of cybersecurity for medical devices and hospital networks is vitally important to public health because it ensures the integrity of the computer networks that support medical devices. Further more the FDA clarified their position on security patches. The statement mentioned the fact that the FDA is aware of misinterpretation of the regulations for the cybersecurity of medical devices that are connected to computer networks. The regulations issued back in 2005 can be downloaded below. The FACT that about 18 companies from the IT industry (Including: Google,Microsoft,IBM,CISCO,SAP,HP,Oracle and Intel) show up there mean that the competition is really heating up for the 3.4B $ stimulus/Appetizer package and that we are in for a whole new genre of vulnerability bulletins.